that you can claim to be His Lover? ki korey ekhane tumi ashbey? how can you reach at the Divine Threshold? dreaming the Paradisal state of His Presence? je tumi eto shohojei hashbey? that you can claim your right to be joyful? shononi to kan petey oshfuto kono kotha tar? have you had the time to listen to the unuttered words of His? remorsefully building what history with the bygone days? je tumi shukher shagorey bhasbey? that you're now worthy of attaining His ocean of bliss? The above song, in its original lyrics in Bangla is one of the finest romantic song and considered a classic. Here the lyrics are commonly understood as speaking of earthly lover. I have taken the liberty to translate it from the vantage point of a devotee's love for the Divine Beloved. A Sufic translation so to speak. Since for the Sufi - Allah, God, Ishwar is seen as a Beloved, every love story eventually appear as sub-set of the Divine Love Story, an echo of the original love, in awake of which the Hidden Treasure wanted to be known and loved and hence brought forth the manifestation. In every love song thus that original Love Story emanates and in this translation I have re-interpreted the statements of the lyricist as a love between devotee and the Divine Beloved and the message still holds true and close to the original meaning. The subject matter of this song is the shedding of tears, the crossing over of the difficult journey, the solitary moments, the broken heartedness, the forgetful moments when remembrance cease, the moment of repentance of lover and sacrifice - all of which are real stages of a lover and can also be seen as stages of the Sufi Journey. In summation they are the entire gamut of the spiritual struggle that takes one to the Threshold of the Divine. The opening lines of the song speak of shedding of tears in realization of separation. 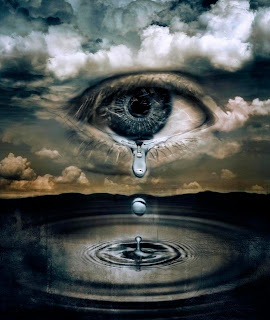 In the religions tradition, such tears that flow from remembering Allah holds a special place because of the sincerity of the Heart from where it originates. It is this sincerity which are invaluable since Allah looks not at the outer appearance of people but at their hearts.